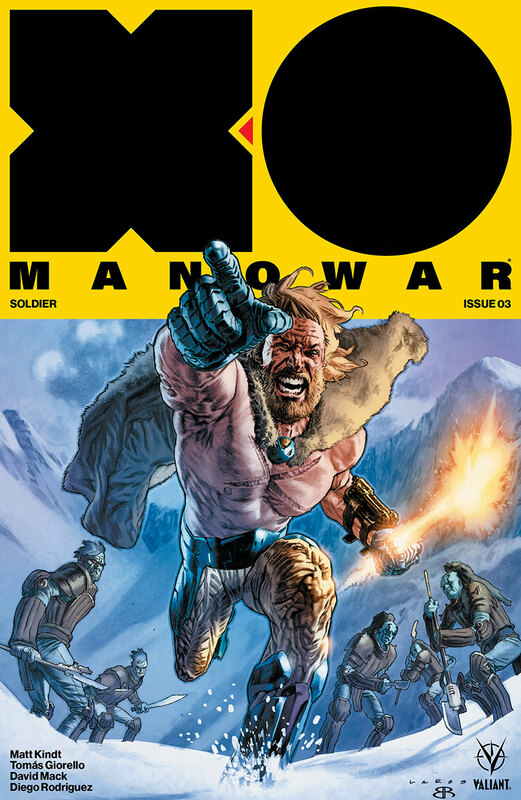 The blockbuster movie that is the comic X-O Manowar wraps up its "Soldier" arc in signature awe-inducing fashion. This latest relaunch of Aric of Dacia has taken him off earth (for reasons still unknown) and his infamous x-o armor now sidelined and condensed into a sentient ring. It's quite the revamp but the results are a balls-out sci-fi action smorgasbord. Matt Kindt has unleashed Aric as a man of action, armor or no armor, leading his suicide squad into battle and being victorious. There's no time to dwell on why and how he got to where he is. What is urgently important is what's ahead of him and it's usually against the odds. His backstory will be addressed when Kindt damn well pleases but in the meantime there's an enemy to topple. Sure, 'X-O Manowar' is action-heavy and it's exciting but Kindt finds some beats to develop Aric and his alien allies. There's a level of world-building that takes place that doesn't come from exposition but in the way Aric has to navigate this strange new world with its norms and rules of engagement. It's part of the book's allure because the reader is learning along with Aric in this new environment.Aric is John McClane, Snake Plisken, and Spartacus all rolled into one. The mission to bring down the enemy's defensive shields is a fast-paced heart-thumping adventure that will the reader breathless. Kindt has reconstructed Aric, stripping him of his power in a sense, his suit of armor and exposing the raw power of a man determined to fight and claw his way through by any means necessary. It's as if he took Superman and drained him of his powers and asked him to survive on his wits and fists. Could he do it? We know Aric can and does so in smart but brutal fashion. Aric proves to be a formidable warrior even without his armor. David Mack and Zu Orzu illustrate a beautifully told opening sequence chronicling the history of the Cadmium race and their relationship to the other races on their world. It's like looking at a set of hieroglyphs with its painted story on a wall describing an unthinkable way of life. The rendering is a nice contrast to the grittiness of the main story. Tomas Giorello is a visual storyteller in his own right, giving the characters a detailed expressive look while conveying movement and form. Kindt's story allows for plenty of fighting and action, giving Giorello every opportunity to blow away the reader with finely choreographed chaos. Diego Rodriguez's colors burst from the page adding a sense of action as well. Using an array of cool tones including blues, purples, yellows and plenty of bloody red, Rodriguez adds depth, texture, and sheen to the panels. It all culminates in a story that comes together with script and art in unison. X-O Manowar #3 is worth buying at twice the price. It's a summer blockbuster in your hands that should be on your pull list at any cost. Kindt and company have a no-holds-barred adventure worthy of praise for everything from script to lettering. This is a no-brainer of a win for readers.